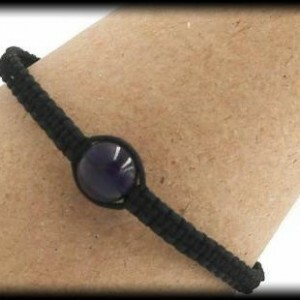 Encourage selflessness and act in the present moment with this Green Moss Agate chakra bracelet. Green Moss Agate encourages personal growth, balances emotions, and inspires new ideas. It also assist in releasing fear, deep rooted stress, and allows you to see the beauty in yourself. Green Moss Agate is the perfect choice for new beginnings. It is a stone of wealth, attracts abundance, and improves self-esteem. 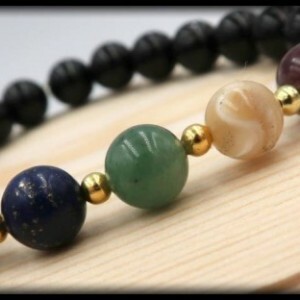 This item contains 8mm beads of White Jade, Amethyst, Lapis Lazuli, Green Jade, Yellow Calcite, Carnelian, and Black Tourmaline. SIZING INFORMATION Please measure your wrist with a measuring tape to ensure the most accurate measurement. If you do not have a measuring tape, you can also use a string by wrapping it around your wrist and then cutting the piece of string. After you have your cut string, place it alongside a ruler and write down your measurement. To ensure a perfect fit, please had 0.5 inch to your wrist measurement, if you want a little room please add .75 inches to your wrist measurement.